Casper with his mugs, I'm really happy with the way they turned out. When designing for zazzle mugs I like to make the image vibrant and extra sharp as I find the print on the mugs can be a bit soft. The one on the left turned out extra crisp. I did have a problem with one of the mugs (not in the photo). The print had slipped off center and had smugged during manufacture. I contacted Zazzle and their customer service is fantastic. They gave me a full refund after I sent them a photo of the faulty mug. 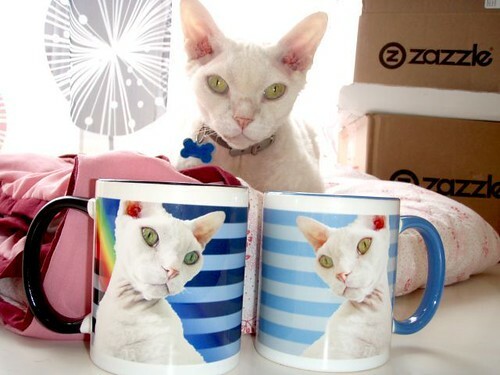 You can find Casper on these products at his Zazzle Store. Make you own custom made mug. Sign up for zazzle coupons.